Standing balanced on two bikes. Bursting through the screen. Ala re Ala.
‘May I Hebb Your Attention Pliss’. Here ladies and gentleman is the first look at the cover for my first book. Not just the cover but the entire spread. Some minor re-touches are being done but this is more or less the final cut. Please click on the small picture above to see a more full-sized (or what is technically called the Shakeela) version of the book spread. The cover was designed by Pinaki De. Its one and only purpose is to “hebb the attention in plissant phashion” of any casual browser in a bookstore, hopefully enticing him/her to pick it up and leaf through its contents. Okay. Now I have three announcements to make. 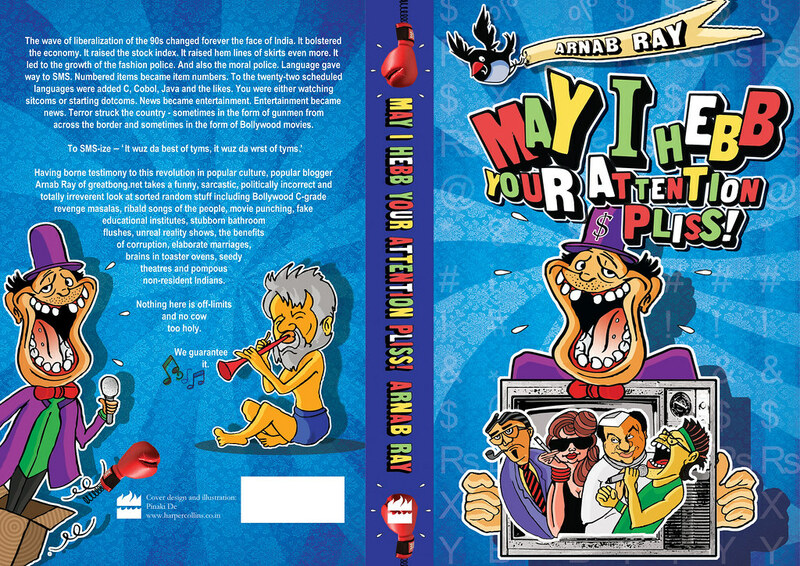 The official launch of my book ‘May I Hebb Your Attention Pliss’ will be at Casuarina Hall, in India Habitat Centre, Lodhi Road on Friday March 5th, 2010 (High tea at 6.30pm followed by event at 7pm). Everyone is invited. There is an event page for this in Facebook. Visit it please if only for the nice picture at the right hand top, which represents for me, the ideal of a successful book launch. An event for ‘May I Hebb Your Attention Pliss’ will be held at Crossword Elgin Road, 8 Elgin Road, Between Forum and Bhowanipore College, Kolkata – 700 020 on Friday March 19th, 2010 at 6:30 pm. Again everyone is invited. Like the Delhi event, there is no need to register or get passes. Just walk in. I will have a Facebook page for this too. Presently. Before that—a little context. When I saw Subhash Ghai’s ‘Yaadein’ I was deeply influenced by not only Kareena Kapoor flinging her jacket in the face of a crocodile but by the surrogate advertisement of Passpass in the whole movie. I realized that for a truly great artistic product not only do you need a solid corporate tie-in but you need one whose name has the same sub-string repeated twice. Like Passpass. Which is why when I was thinking of doing a virtual book event for those not in the cities of Delhi and Kolkata I could look no further than Dimdim, the open-source (jo apna code rakhta hai khulla…. ), zero-install, fully browser-based web-conferencing service. And so when the good folks at Dimdim gave me, most kindly, a Pro account (which allows 100 concurrent participants) I felt as grateful as I felt when the end credits of ‘Yaadein’ rolled. The virtual book event will be held on Saturday January 30, 2010 at 11:00 pm Eastern Standard Time which is 9:30 am Indian Standard Time on Sunday January 31 (Please note the difference in dates due to time difference). You only need an email id to register. Once inside the conference, we can discuss any and everything—from book, to the blog from KKR to KRK. Please watch this blog and the Facebook group for further updates and contests. The cover is brilliant..and so is the write up..
allthe best for book dude…id there comes a trend which #bongblocks I will surely buy the book..
Congratulations GreatBong! You’ve entertained us for long and I wish for spectacular success of your work. Are your blog readers going to find something new in your book? @Ashish, Yes. Very definitely yes. Many topics I have not touched upon in the blog–like TV serials, the “hollowness” of most management education (kind of), NRIs, customer-service, Aatish, Clerk……. Good Luck Arnab, I will definitely buy the book and will be there for the virtual book event. Please post if there will be any other update for your fans in US. All the BEST for book…. GB Why don’t you do the publicity of the book the way Aamir Khan did for “3 Idiots”. Like a surprise visit at Savita Bhabhi’s house. A pic with you and KRK on your FB page. Congrats GB. Will be there for the Delhi event. By the way this Shakeela version refers to THE Shakeela who was a regular on SunTV (post) midnight movies? Is she still going … er.. strong? Have lost ‘touch’ since I shifted to Delhi. Hey GB, Gud luck with the book. Although it will be very much an early morning, will catch u on 31st Jan! Even I would like to be seen with Savita Bhabhi. Which one of you boys want to play cricket with me and we can knock the ball into her house? Pliss read my book. The way things work– if you read my book, my book sells (i.e. make me a Kieron Pollard), If it sells, then I will get multi-city tours from publishers. Has anyone done that two bike stunt apart from Ajay Devgan in Phool aur Kante? And now metaphorically speaking, you. The cover looks fab – I love the colours! Will online cricket do ???? best of luck dada…will surely be among the first few to grab a copy. btw did u mention the approx. cost anywhere? not that its going to stop me from grab it (nothing can stop me from grabbing :)). aar ekta proshno jodio i think i have idea about the answer. but boi-ta ekta coherent narrative naki more of a collection of probondho? No Hyderabad either!! I understand you are a bong and all and you HAVE to go to Kolkata, but we have a 3 lakh strong Bong community here, plus you have a huge fan following… we would love to see you here. I’m also glad to see that you have written about “Aatish” and I believe we’ve had a conversation about this earlier on it being both our favorite “stylish” Hindi film. I’ve been reading your blog for the last two years and never dared to comment till now. But this blogpost has something in it which force me to do do that! why are you not coming to Hyderabad? The city of Nawabs will treat you with enormous servings of Chicken/Mutton Biryanis and Payas (Sad that it is not the Ramzan season.. or else I could have added Haleem also to the list). Can I preorder the book? and please find a way to come to Bangalore! U can also add a picture or even a dialogue of Prabhuji (Aailaa Mithun) to bring some good omen ;)…. Else…wahi baat ho jaaegi ki…Kauwe ne cheel ka chumma liya aur cheel ne choohe ka bachcha paida kiya! Oh no, GB, the web launch is at 4 a.m. GMT! Couldn’t you do it at 11 a.m. EST and thereby satisfy fans in most continents? Just kidding….. if your blog is anything to go by, your book deserves to be bought. And the Habitat Center; used to be my fave hangout…. miss it so much. Will surely buy the book, though….am hoping its better than the blog! One question, though: what’s it going to be priced at? Unsolicited (and probably unwise) suggestion: the “greatbong.net” mention on the back-cover could stand to be highlighted (e.g. be put in bold). It would help a tiny fraction of your blog’s readers (e.g. ex-readers) notice the book, and would help a tiny fraction of the book’s readers find the blog. Maybe such changes aren’t possible now? Is it possible to have the last line “We guarantee it” in a single line? IMHO that would look better. 1.Waiting to buy it as soon as it comes out. 2.Any readings planned in the Philly area in 2010? Any launch events planned for Bangalore?? Hope the book will stay affordable. Wouldn’t want to spend a Harry Potter-ish 600-900 bucks on one copy. I have been reading your blog for a year now and love it. This is my first comment though. Congratulations on your book. How can someone get it in the US? I can’t wait to get my hands on it. The book cover looks great !!! The contents will be even better and spicier !! Have to disagree with you. The book cover spread could have been better. Looks too concocted. Almost like Richard Gere trying to play a Govinda role. Missing the natural dementia that Arnab’s brings forth everytime he pats the keyboard. HarperCollins is rubbing off on him. Beware! India Habitat Centre has a habit of turning honest people into Jholawallahs. I wish you had a Bombay event, though, and if it’s not too late, I’d urge you to ask your publisher to fit in events in some other cities as well. I’m sure you have fans everywhere, and your personally launching the book would make a big difference. “Jiski bitiya badi ho gayi.. Looking forward for your book. The cover is reminiscent of the old MTV and Channel V ads and the new VH1 ads in the US. Is there a specific genre of marketing that goes into such designs? I mean the careless drawing and the vivid colors and pimply caricatures? Just wondering! Congrats on the book launch, will try to get one from a frequent-flyer. Is it on Amazon? That would be nice. I hope that you have explored your poignant side, that came up with “A letter from Andaman Cellular Jail” (though technically not your own prose) If not, well there will be a next time. If yes, I vote Mumbai. I will buy it only for “AATISH”. Is this book going to be available in the US ? I mean amazon etc ??? Maybe you should have an “FAQ” page on your blog for such questions. Will miss the events but will join online. All the best. No Mithunda on the cover? Hey Arnab, congrats on the book release! Looking forward to Sidin’s book? Good luck! Looking forward to reading it. Two small sugestions for the back cover writeup. Some others have also expressed similar views. Greatbong.net should better be in bold and (and perhaps in a different colour) so that Arnab Ray’s connection with Greatbong catches the eye of the browser at the bookstore immediately. The last sentence: “We guarantee it” should be a single line. Hey GB, how could you skip Bangalore. I am sure you have a huge fan following here. All of us are eagerly waiting for the book. best wishes! The way readers have been pleading for events in Mumbai, Hyd, Bangalore Chennai and Philly, I am surprised why myriad readers from other cities aren’t pleading their case yet. Here is wishing you an atleast 10,000 copy success for your book..
Will your book be available online on Amazon , Ebay or anyother online book store? How about getting Prabhuji as your chief guest. Your writing has contributed in him being known as Prabhuji worldwide (or at least on the net). Best of Luck for the Book!!! Congrats! 2 potential blockbusters in the offing: Dork (Sidin’s book) and your book! see you at IHC! will definitely be there in Delhi at the book launch and will surely buy my copy but still curious to now the price of the book (please keep it reasonable so that a lot of people buy it and get to know greatbong and his inimitable style of writing)…i became your fan after reading your hilarious THOUGHT PROVOKING reviews of “Tahalka”, “Mr.Prime Minister”, “Gunda” & “Jaani Dushman”…now waiting for “Aatish” …keep up the good work, all the best ! All the best for your book!! ham aapki book ki baraat pan parag se swagat karenge. Aapke samaye ke liye shukriya. GB – have been an avid reader and fan of your blog. Thrilled that you’re finally going to do the only thing you should and publish! I shall buy your book and shout about it from all roof tops. All the very best. And let me join the bandwagon and ask you to come to Do-buy one of these days on a book tour or something.